RegTech was the buzzword across financial services in 2016. 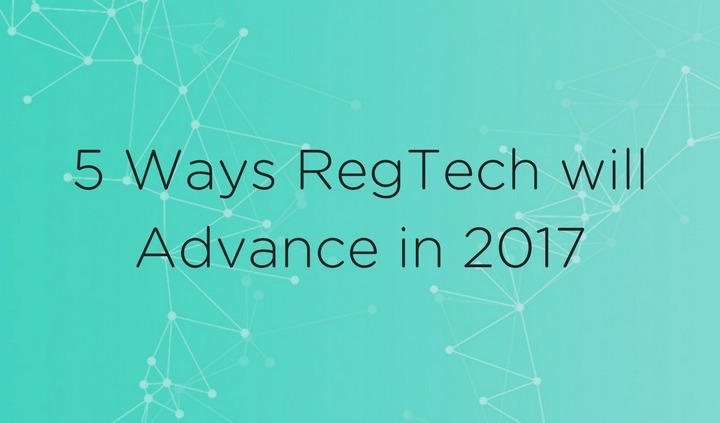 As the industry firmly establishes itself in 2017 we make five predictions for which trends will help maintain RegTech’s position as the most exciting field in the future of regulated industries. There’s no doubt that RegTech will continue to build on the gains it made in 2016. Growth will come from new technologies being built to serve the specific needs of regulated firms both within and beyond financial services. We predict special attention will be given to the Insurance sector, likely to be among the first to embrace RegTech in 2017. RegTech firms will continue to mature by incorporating lessons learnt from the past year, making their products more efficient and user friendly. We will see greater collaboration between next generation technology providers and incumbent financial service institutions, supporting an atmosphere of enhanced innovation – which will spearhead further growth in the years to come. Machine Learning has enabled many RegTech companies to dramatically transform regulatory practices. Machines can process and learn from infinitely more information than humans can in less time, spotting trends and red flags at an earlier stage. As the quantity of data that must be analyzed for various types of compliance increases, systems that use machine learning will become indispensable for the regulatory success of companies. Behavox uses machine learning to process huge amounts of employee generated use data to identify rogue activity. By using advanced natural language processing and relationship mapping it can identify different types of abuse, improving a company’s risk management and helping companies comply with Basel II & III and MiFID II. At ComplyAdvantage we are using Machine Learning to take the pain out of labour intensive Anti-Money Laundering and Counter Terror Finance (AML/CTF) compliance, allowing companies to automate simple tasks like screening watchlists. On a more complex level, machine learning has been used to create intuitive systems which can actively identify people who pose a financial crime risk. Additionally, it has allowed companies to upgrade their adverse media screening by building richer risk profiles on threat actors from a greater number of media channels. The space of electronic identification and verification (e-ID&V) is expected to really take off in 2017. With developments being made in machine learning, biometrics and blockchain all expected to transform the industry. Electronically enabled ID&V will allow companies to speed up KYC procedures by facilitating non face-to-face verification and by making it easier for customers who have limited credentials to access financial services. Trulioo is an e-ID&V company that allows companies to verify users by automating the process of confirming identity and performing background checks. By harvesting information from multiple data sources into an API, they have significantly reduced the amount of time it takes to onboard new customers. Many commentators believe that e-ID&V will only be truly realized when we fully adopt blockchain technologies. Whilst Blockchain definitely has the potential to facilitate secure global ID distribution for KYC it is important to distil the hype around it. Wide scale adoption of blockchain technology is still two to three years off and before it is widely used its full potential for e-ID&V will be constrained. Tradle is one company blazing the trail in this field, with its pioneering use of the blockchain to securely distribute KYC information. RoboAdivsors form one segment of the growing world of “chatbots”, which are used online to improve customer experience and engagement. Specifically, RoboAdvisors offer tailored advice to enhance the quality of decisions making in financial services. Companies within financial services have the regulatory requirement to have an adequate risk assessment and understanding of their specific risk exposure. RoboAdvisors can reduce the burden of this compliance process by automating parts of a risk assessment. They can also improve the quality of high risk decision-making by offering advice which has been gleamed from processing historical data. We predict that in 2017 RoboAdvisors will transform how individuals engage with their risk and compliance obligations. InvestGlass is a FinTech provider which offers a pure B2B solution for discretionary portfolio management and advisory. Its customizable RoboAdvisor applies pre-advice checks and generates branded investment proposals to ease the work of users. We predict advances in RegTech will greatly improve how transaction monitoring is conducted, helping to improve the detection of money laundering and terrorist financing. In 2017 this will be especially important as financial crimes become more sophisticated and as foreign fighters begin to return home. As the threats change it will be essential for companies to work together to monitor transactions in their entirety. For this to be effective industries will require greater clarification from regulators on information sharing. It is estimated that in 2017 $60 billion worth of payments will be made on mobile platforms. The move towards a “cashless society” means that banks will have to monitor a greater number of transactions, whilst ensuring new payment systems don’t become vulnerable to financial crime. Banks that use RegTech for transaction monitoring will be able to scale their screening effectively as trends in payments evolve. Initiatives such as the Payments Strategy Forum will prove to be essential for planning the future sustainability of the payments industry. The direct benefits of RegTech are being felt across all regulated industries and will be entrenched in compliance for years to come. But in 2017 we predict firms will begin to use the insights generated by RegTech’s sophisticated data analytics to gain even broader business value. Most RegTech solutions work by processing huge amounts of data into useable information, this digested information has value for business areas other than compliance. Marketing departments for example can benefit from user activity baselines to better understand user choices and actions. Not only does this help marketing teams to better understand their customers but it also helps product developers to gauge the risk appetites of clients – allowing for better customization of products. QumRam can track and record 100% of all digital interactions across web, mobile and social channels helping their clients comply with regulations which require online interactions to be recorded and stored. But further to achieving regulatory compliance, the customer data collected can be used by other areas of the business. By ensuring compliance across all digital channels, marketing initiatives aimed at gaining and retaining clients can be accelerated. Customer service departments can use the data to increase satisfaction and loyalty. And customer journey analytics can be aggregated and assessed, to increase conversion rates, and improve the digital experience. 2016 may have been the year that you heard of RegTech, but 2017 is the year when you’ll understand why your business can’t succeed without it.